background spread cloth on the lawn. Splendor Solis, 1582. British Library. 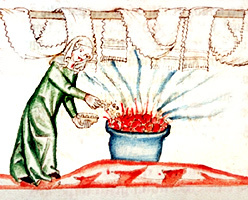 One day an employee of mine asked me off-handedly, "How are medieval clothes washed?" Without thinking I answered, "In a running stream and beaten on a rock." About a month later a customer called to praise us for the authenticity of our clothing, "Even the care lables are authentic!" "What," I wondered, "was she talking about. They didn't have care lables in clothing in the Middle Ages." So I checked the lable and was suprised to find that my employee had taken me at my word and printed a batch of lables that read "Wash in a flowing stream and beat on a rock!" Now clothing from Chivlary Sports comes with modern instructions but this incident did make me curious about how people kept themselves and their clothing clean without the aid of indoor plumbing, washing machines, 24-hour dry cleaners, and modern cleaning products. I searched the internet and found a lot of misinformation about the origin of soap and the horrid hygiene of the Middle Ages and Renaissance. Many sites repeated the story of how soap was discovered by accident on Mount Sapo in Greece where animal sacrifices resulted in wood ash and animal fat mixing in the rain. Well first, archeologists have not found any Mount Sapo used for sacrifice. Greeks didn't sacrifice the fat of animals, only the bones and hide. On the other hand there is evidence of soap production in Egypt and Babylon long before Greeks were building temples. In fact, the earliest soap recipe ever found was written in ancient Babylonian on a clay tablet around 2200 BCE! (Wikipedia) Pliny the Elder wrote that the Gauls and Germans used soap on their hair, which he found odd. At that time Romans didn't use soap at all, though they bathed in water and removed dirt from their skin with a scraper called a strigil. The father of physicians, Galen, advocated the use of soap for cleaning clothing and bodies in 200 AD and reported that German soap was best. By the 1600s soap manufacturing was a big business in Europe. Vegetable fats like olive oil were used to make Castile soap in Spain and White Soap in Italy. Southern France became famous for its scented soaps. In England, King Charles I granted a monopoly on the manufacture of soap for £20,000 in 1630. According to Katherine Ashenburg, author of Clean: An Unsanitized History of Washing, every culture defines for itself the acceptable level of clean. Even today doctors warn that over-washing can damage our hair and skin but we are more influenced by advertisers who insist that showering daily with their products is the only way to be socially acceptable. When we wash our clothes after every wearing we are not only supporting the detergent makers but also reducing the useful life of our clothing, thereby making it necessary to buy more clothing. We are also polluting the oceans with detergent and other chemicals. But in a modern consumer culture we are told that humans should not smell like humans but like a "piece of fruit or a cookie." Most of us don't get very dirty each day. We wash to remove natural musky smells, then we treat our clothes and bodies with perfumes often made with musk. The people of the Middle Ages rarely used soap on their bodies but they did use perfumes and scented oils. They washed their hair as little as possible but they brushed or combed it daily to give it luster. Women wore their hair up and covered to protect it from dirt and smoke. Men hired barbers to shave or style their beards. Medieval and Renaissance art rarely depicts body hair on men or women so they may have plucked or shave their bodies like the Muslims. 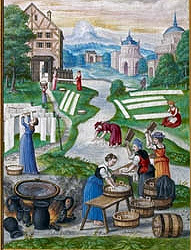 Bathing once a week was the norm in the Middle Ages. During the Renaissance personal habits took a turn for the worse. Plagues, wars, and social upheaval in the 1400s led to a collapse of the feudal system across Europe. Masses of people moved from rural areas to towns that had no sewers or water treatment capabilities. By 1500 so many wells and waterways were polluted by sewage dumped into the streets of the rapidly growing cities that water was widely believed to be dangerous to health. Since they didn't understand the connection between pollution and disease, even rainwater and clear lakes were suspect. Doctors warned against bathing because it "removed the protective layer of dirt and sweat" on the skin! While they may have carried things too far (Queen Elizabeth only bathed every three months,) dermatologists are now suggesting that showering a couple times a week is, in fact, better for your skin than daily washing. Your skin and scalp produce natural oils and antibacterial chemicals that protect you from germs. Over-zealous washing can cause chapped skin, reduce immunity and stimulate the oil glands to overproduce. But, lest you think our ancestors all went months without bathing, consider this—it was customary to offer travelers a bath when they arrived and ettiquette demanded hand washing with scented water before each meal. In Muslim countries hand and foot washing was required before prayers five times a day. Ritual bathing and baptisms were a part of important Christian ceremonies like elevation to knighthood, so clean water was still associated with goodness. Regardless of what doctors said, people still craved the sensuous pleasure of a warm bath and were willing to pay. 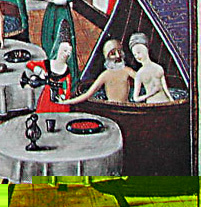 Along with other pleasures, brothels offered luxurious baths accompanied by music, food, and wine. Drying clothing on the lawn, Jan Bruegel, 1625. To prevent sweat from soiling the outer-clothing, linen under-clothing was worn next to the skin and changed daily. If it wasn't dirty, the linens were simply aired out and worn again. Most people had enough underclothing to last a month, even if they only owned one or two changes of outer clothing. Outer clothing was rarely washed. Stains were spot treated. Then the valet would hang the clothes over a frame then brush the fabric to remove dust and dried sweat. If the clothing smelled bad, it was perfumed by hanging it over burning incense or heated perfume. When it was time to wash the linens, it was a big project and took many hands to complete. Some under-clothing only needed rinsing in the stream. But clothing with oily deposits, stains, and body odor needed more work. The linens were first boiled in water to loosen the oils and grime from the fibers. This also disinfected the clothes though a Medieval laundress was blissfully unaware of the danger of germs. While the clothes were still warm, the laundresses would beat the wet, folded linen to drive the water from the fibers with force and soften the fibers. If the cloth still had stains, it was treated in various ways with lye, soda, ox gall, alum, vinegar, or lemon juice then rinsed with clear water. Stains on dyed fabric were treated with homemade stain removers applied to cloths made of the same color as the soiled fabric so that any dye transfer would be the same color. Recipe books for stain removers were nearly as common as cookbooks. Bible Picture Book, 1327-1335, British Library. Some clothing and dyestuffs were heavily soiled with oil and grease. They used soap made of tallow and wood ash lye to remove grease. They also used other products like fuller's earth, powdered bone, starch, pulverized soapstone, and feathers to absorb oil and grease in clothing. Wax and resin were removed by heating the stain and rubbing tallow into the softened mass. Tallow melts at a lower temperature making it easier to remove, sort of like using peanut butter to remove gum from hair. Then they would use a heated silver spoon or a tailor's iron and an absorbent cloth to remove the rest. They dried the clothing in the sun by hanging it on temporary clotheslines or by laying the clothing out on the grass. Not only did the sun bleach the cloth but the oxygen expelled by the grass also acted as a natural bleaching agent. Leaving the linens on the grass for up to four weeks in summer resulted in permanent bleaching to a dazzling white. Another method that was only effective on silk and wool was to fume dampened fabric with burning sulphur. This creates sulphur dioxide, a poisonous gas so fuming had to be done in specially built chambers. Keeping linens white while not damaging the gold or silk embroidery was especially problematic. The solution included soaking the item in warmed urine for half an hour! Lye was also used for bleaching and treating stains. There were many different recipes for lye. The strongest lye solutions included lime, a very caustic substance. Some of the weaker llye mixtures used ashes from wine lees (dried grape husks left after fermentation) gentian roots, and even ashes from pea pods. Clothing had to behung on pegs or stretched over bell-shaped frames to dry inside during wet or cold weather. They smoothed out the wrinkles during drying so they rarely had to iron anything. Ironing was used mostly during the tailoring processes to create flat seams and curved collars. Special irons that looked a little like curling irons were used on ruffs in the Renaissance to give them a perfect curve. To preserve the crisp shape, linen was soaked in a starch solution and ironed while it was still a little damp. Sometimes the starch was tinted to make the ruffs a pastel pink or blue. The Dye Woorkes a page of links to 16th century recipes for stain removers and dyes. If you want to add this article to your list of favorites or email it to a friend, please use this permanent URL, https://stores.renstore.com/-strse-template/0905B/Page.bok. Permission is granted by the author to quote from this page or use it in handouts as long as you include a link back to Renstore.com.